Enjoy sunsets on the east side of Seneca Lake at Wood and Water, a 5 bedroom, 3 full bath (new fireplace, marble shower and tub), year-round home on over an acre of land. This is an all wood interior home hand-built. No drywall or plywood - all solid wood. The house sleeps 12-14 comfortably and offers every comfort and amenity that you might desire: convenient location to Geneva; wonderful restaurants, shopping, wineries and breweries, privacy, breathtaking lake views, 2 decks, Jacuzzi tub, fireplace, 100' of waterfront, swimming from dock, canoe, paddle boat, and much more. This waterfront home is ½ mile from East Lake Road back on a private drive, within a mile of Three Brothers, Ventosa, and Zugibee Wineries. If you like peaceful lakeside accommodations with no traffic noise, no roads to worry about, consider Wood and Water. Enjoy the first floor master bedroom facing the water. The master bath has a queen-size bed and a master bath with a large Jacuzzi for relaxation. An additional full bath is on the first floor as well. Two lakeside bedrooms on the second floor, (one with queen bed one with king) and two additional second floor bedrooms (one with three twins and one with queen, single and a full-size crib. There is over 100' of frontage on Seneca Lake with a new permanent 100 foot plus dock with room on the end for the whole gang. Water depth increases gradually. Lots of white cedar Adirondack chairs and tables on the beach. Shade or sun - your choice. Sunfish sailboat, canoe, paddleboat; all on the beach for you to enjoy. This is a vacation home and is limited to 14 guests. It is not a home to rent and host parties or gatherings above the maximum occupancy of 14. The 14 guests number applies day or night. Rental is Saturday to Saturday - in at 4PM out at 10AM. We want to be very clear - no house parties! CANCELLATIONS: A forty-five(45) day notice is required for cancellation. Cancellations that are made more than forty-five(45) days prior to the arrival date are subject to a 5% Cancellation fee or $50 whichever is greater. Cancellations or changes that result in a shortened stay, or that are made within 45 days of the arrival date, forfeit othe full advance payment/reservation deposit. If alreadyplpppp ppaid, all security deposits will be returned in full if you cancel. Additionally, if we are able book the home during the same dates (your cancel dates) we will refund you minus the aforementioned 5% cancellation fee. Cancellation or pull pearlyopp departure does not warrant any refund of rent or deposit. You may choose to purchase travel insurance separately. Keywords: Beautiful hand-built 5 bedroom all wood home on the water. There are three queen-sized beds, one king and four twins, plus a roll-out and futon. We savor our time on Seneca Lake with friends and family, creating wonderful memories with our three children. We enjoy the clean cool waters and the peaceful surroundings, as well as the wonderful wineries and restaurants. 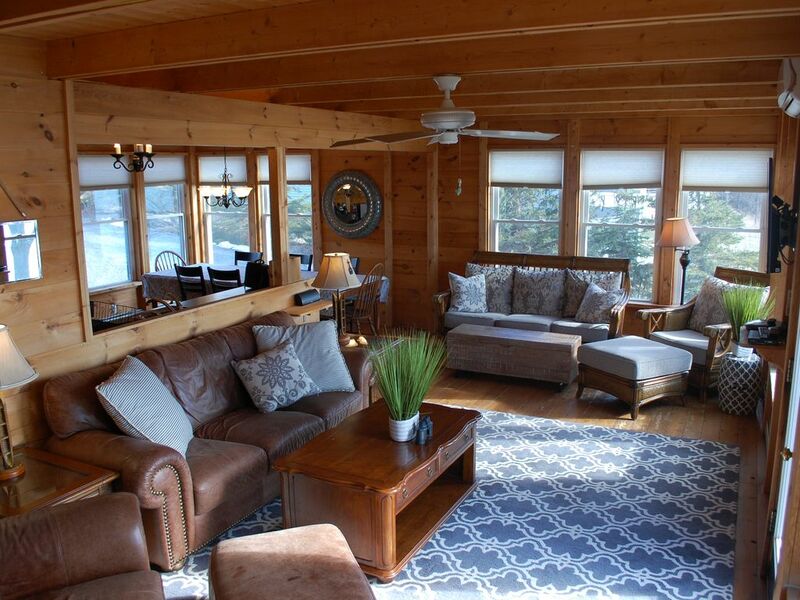 We enjoy making constant improvements to our all-wood home (with an interior full of that rich wood smell) and look forward to sharing our lake side retreat with you. We purchased this home from a family who built it together by hand, and we hope to maintain the wonderfully warm and inviting feel. The view of the lake from this home is so inspirational, the waters are clean, refreshing and replenishing. Besides relaxing and taking in the beautiful surroundings, there are various water sports to be enjoyed --boating, sailing, canoeing--there are over 37 wonderful wineries peppered around the lake, local dairy farms for cheese and ice cream tasting, local parks and beaches, biking and hiking paths, restaurants, spas, water parks, even Waterloo Outlet Mall is close for rainy days. We hope to retire in this lake home someday. With three children and a family landscaping business we are limited in the time that we spend at the lake. Therefore, we are renting it to allow others the opportunity to enjoy the peaceful setting on the water---renting also helps pay the taxes and maintenance costs. So please enjoy the all wood home and the stars - the quiet and the lake. With the low ambient light you will see lots of stars. Just walk out the door onto the deck and look up - millions of stars and the sound of waves. In the winter enjoy all the wild waterfowl from all over North America - Seneca Lake does not freeze so enjoy all the waterfowl wintering over - including lots of loons. See Osprey and bald eagles fish and fly. This is a place of peace and quiet - of nature and when inside the wood smell and sight gives a comfort to all. Surrounded by nature: farmlands, fishing, bird watching--1/2 mile from main road yet within ten miles of town, shops, restaurants, world-class wineries, breweries, grocers (Wegmans, etc.). Less than 10 minutes to the town of Geneva, Hobart College, restaurants, shopping, and more. Enjoy a multitude of festivals, marathons, triathlons, boat races, car shows, fairs and farmers' markets. Because our house is situated over 30 feet above the beach, we have a magnificent view of the lake from almost every room in the house. Over 100' of beach front, swim from the dock, paddle boat, canoe and sunfish. Lovely deck near water, perfect for sunsets and campfire right near water-- cedar Adirondack chairs and tables on beach. Gorgeous lake views from the house as well as beachfront. Located on the East side of Seneca so you get to view the wonderful sunsets. Close to wonderful restaurants, world-class wineries/breweries, grocery stores, marinas and everything you might want/need. For 911 calls - great cell phone reception in the area. Permanent dock over 100 feet long and 16 feet wide on the end, Large Jacuzzi in the master bath, Hi speed wifi throughout, over an acre of yard, over 100 feet of waterfront, 3 waterfront bedrooms (two queen beds, one king), east side of the Seneca Lake so great sunsets, canoe, paddleboat, and sailboat. The house, yard and spectacular view was enjoyed by all. Owners were very responsive. We didn’t want to leave. Great house with great view. Great house with much character. Facilities were excellent and owners were superb to work with. We had 12 people and the house had room for all. A little piece of heaven! Highly recommend. Just got home from a long weekend at Wood and Water for the Hobart and William Smith graduation. The house is immaculate with a wonderful feel to it. The photos can't do it justice...it is much larger than it appears. There were 11 of us sleeping there. Plenty of room/rooms/bathrooms. The main living area is perfect for gathering but there are many other places to retreat to if you need a break. We had some friends over for dinner and the large deck, backyard and dock as well as the main living area gave us lots of room to visit and mingle. The hosts were so great to deal with. Very patient with our questions and gave us great info on local places to eat and visit. The beds were comfortable. Each room has a ceiling fan and there is updated AC units (which we didn't need) so you can regulate the temp to your liking. We used the grill and the oven...whatever kind of food prep you need is there. And the views!!! Mornings are beautiful and sunsets are spectacular. 12 ish minutes to downtown Geneva and all the cool places that has to offer. What more can I say? Highly recommend. Helped make a special occasion even more memorable for my family and me. This is my first time using VRBO, and it did not disappoint! The property we stayed at was gorgeous, clean, had an ideal view, and was perfect for our girls' weekend getaway! As the Maid of Honor for my sister's wedding I wanted her to have a perfect weekend in the Finger Lakes, since this was where she got engaged, and the whole weekend went so smoothly. We loved the place, it was PERFECT for our group, and the dock provided a beautiful backdrop for group photos! I would DEFINITELY stay here again. Lisa, the property owner, communicated quickly and clearly with me, and was so warm and accommodating. Thank you for a wonderful weekend! Beautiful home - we enjoy staying here every year! Wonderful property. Owners are easy to work with. House is well maintained. We come up every year for the Deck the Halls wine tour and love staying here! Amazing house!! Perfectly located for winery visits. Our book club of 9 ladies and a baby spent a weeny here exploring the local wineries and sites. The house is beautiful and even better than described. The owner was great and gave us perfect suggestions of where to visit and go hiking. You will love this house and the amazing sunsets over the lake! Great fireworks displays on holidays right from the dock, go from Seneca Lake all the way to the ocean - connected to the canal system, Watkins Glen at south end of lake so world class NASCAR, Hobart and William Smith Colleges 10 minutes away, Syracuse and Rochester less than an hour away.